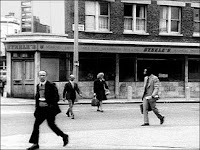 The film consists almost entirely of a single continuous shot of Stamford Road in Dalston Junction, a downbeat area of east London. The camera is mostly trained on the offices of a plate glass company at the corner of the street, and records passers-by as they go about their business. The conceit of the film is that everything that moves or appears within shot - pedestrians, cars, pigeons, even clocks – is following the instructions of an omnipotent director who appears to be behind the camera: ‘Now I want the man with white hair and glasses to cross the road … come on, quickly, look this way … now walk off to the left.’ Pedestrians put cigarettes in their mouths, talk to each other, eat chips, take their glasses off, cast a glance behind them or look at the camera, all at the apparent behest of this offscreen director. The mostly-fixed camera suggests a proscenium frame in which the pedestrians are actors waiting to come in from the wings of a stage set. As the film progresses, though, this impression of directorial omnipotence is slowly undermined. The director’s instructions become increasingly complex and his voiceover starts to lag behind what is happening onscreen. He cannot keep pace with the action, as people arrive in shot whom he has not mentioned, and events take place that he has not prescribed. He becomes breathless, coughs and stumbles over his words. The world will not obey his instructions. The Girl Chewing Gum was inspired by Francois Truffaut’s Day for Night (1973), a film about the making of another film. Smith was particularly struck by a scene in which the director gives instructions to the extras as well as the main actors, and even tells a dog to piss up a lamppost. The pedestrians’ movements in Smith’s film – which have, in case you haven't worked this out by now, simply been filmed rather than directed - seem very strange when watched in this concentrated way. People do not just pass by: they stop, fold their arms and then walk back to where they came from; they read newspapers while walking, oblivious to where they are going; they flap their arms about for no apparent reason. 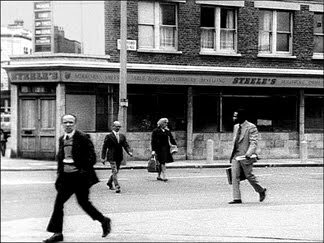 And the strange fashions of the mid-1970s (tartan fleeces, collar-length hair, horn-rimmed NHS spectacles, flared trousers, sideburns and Afros) make the passers-by seem like they belong to a lost world. Great - thanks for sending that link. "This is a good posting, I was wondering if I could use this write-up on my website, I will link it back to your website though. If this is a problem please let me know and I will take it down right away"